Did you ever feel just a little too comfortable for your own good? For example, in cooking. I do so much cooking and baking, every once in a while I let my guard down, and I have a failure that definitely could have been avoided, with a little more vigilance. It is definitely a hard concept, and one that often needs constant reminding. Then I think about my children…and how it is best to start young with that lesson. My older daughter plays softball – and her team is really good this year. They are actually undefeated, if you can believe it. At this point, with their 8+ wins, I can see they are starting to be a little over-confident. The other night they really got a scare – a team that they had beat 19 to 0, came back in their next game to tie it at 5 runs. I could tell they were a little nervous – and it was a good thing. I still cheer loudly at every game – but I worry about them heading to the play-offs if they stay undefeated. Aside from the expectations they will have – the other teams will be playing their hearts out. Obviously though, it is a hard lesson to learn. The other weekend I made some more rhubarb jelly – and I had some pectin left over from last season. I was feeling pretty confident with my jelly making abilities – and would you believe the jelly never really set? It is fine if you stick it in the refrigerator, but it is not my normal product. I should have known better than to use that pectin, and that if it failed the plate test at over 220 degrees, there was probably something wrong. 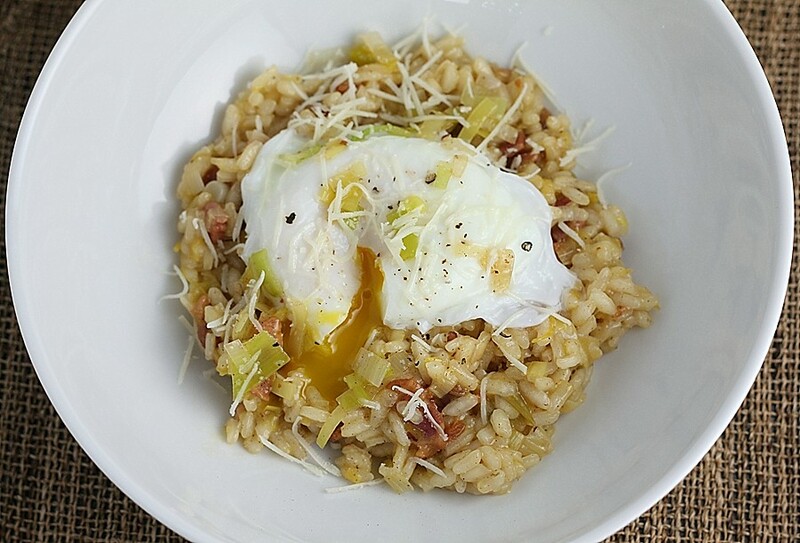 Fortunately this risotto from Cooking Light is kind of dummy proof. I made this for the girls after a long day, when my husband was away. I was definitely not all there when I was making this, and it took me by surprise how good it actually was. I had to run and grab my camera and take a shot of it – which I had no intention of doing. It was also a big hit with the girls, even with the spinach – score. So – the next time you are not feeling completely on top of your game – don’t worry about pulling this out for dinner. Even if you are over-confident – the results will not disappoint. Melt butter in a large saucepan over medium heat. Add onion and garlic to pan; sauté 2 minutes or until onion is tender, stirring frequently. Add rice to pan; cook for 1 minute, stirring constantly. Add 1/2 cup broth to rice mixture; cook for 5 minutes or until the liquid is nearly absorbed, stirring constantly. Reserve 1/3 cup broth. Add remaining broth, 1/4 cup at a time, stirring constantly until each portion of broth is absorbed before adding the next (about 22 minutes total). Stir in tomatoes; cook for 1 minute. Add cheese, pepper, and salt to rice mixture, stirring constantly until cheese melts. Remove from heat; stir in reserved 1/3 cup broth, spinach, and basil. 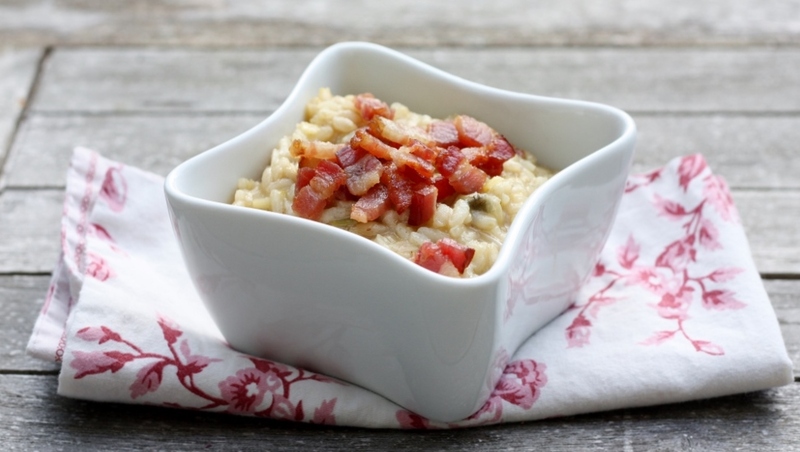 Place 1 cup risotto in each of 4 shallow bowls. Drizzle 1 teaspoon oil over each serving. I am having one of those weeks – I call them, “I have fallen and I can’t catch up” weeks. I come home everyday with my inbox completely full of email, the girls asking a million questions, and I can’t even think about what to make for dinner. Oh, and throw Halloween into the mix – and things have really just been turned upside down. I really can’t complain though, not after seeing the pictures of the devastation that occurred this week from Hurricane Sandy. My parents live in New London, CT – and I have been going there all my life. The seawall that I have walked on thousands of times has crumbled – and the debris on the streets was quite a sight – a toilet seat, a refrigerator? Probably from one of the beach clubs that got washed away. Very sad. Thank goodness they were safe, as was their home. It is going to be a long time though before the neighborhood gets back to normal. Even though we didn’t have a hurricane, the rain here has been something else. We had our 60+ days of sun, and the rain came pouring back into our lives. This post brings me back to summer. My family loves rice – and for the most part I buy it frozen and warm it in the microwave. I saw this recipe in Cooking Light though, and had to indulge. This was delicious – crispy on the outside, creamy on the inside – with a really nice tangy taste from the yogurt. 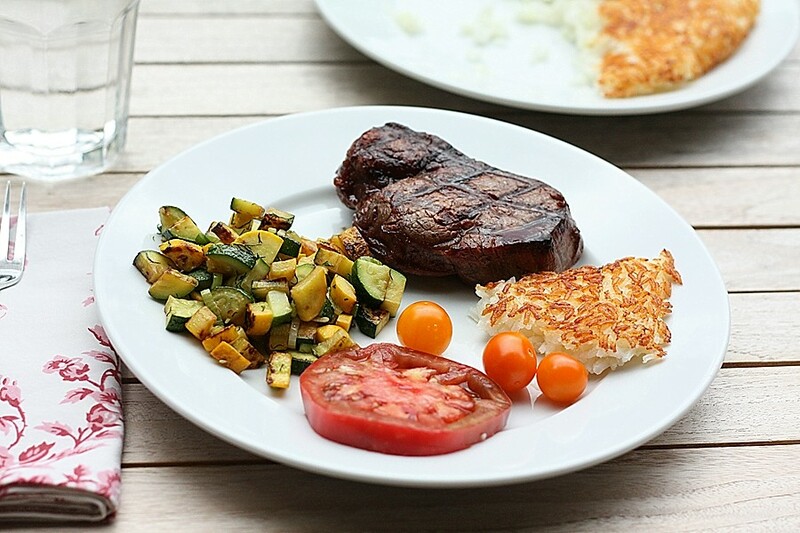 Everyone loved it, and it was the perfect side to go with our summer vegetables from the garden. Goodbye summer, see you next year. And to all of you on the east coast – I hope you survived the storm ok. I hope things can go back to normal soon. I saw this recipe in Bon Appetit and I immediately thought of breakfast, and then my mind went straight for dinner. As I have mentioned many times before – I love a good egg for dinner. Add some bacon, leeks and risotto to that, and boy do you have yourself a killer meal. 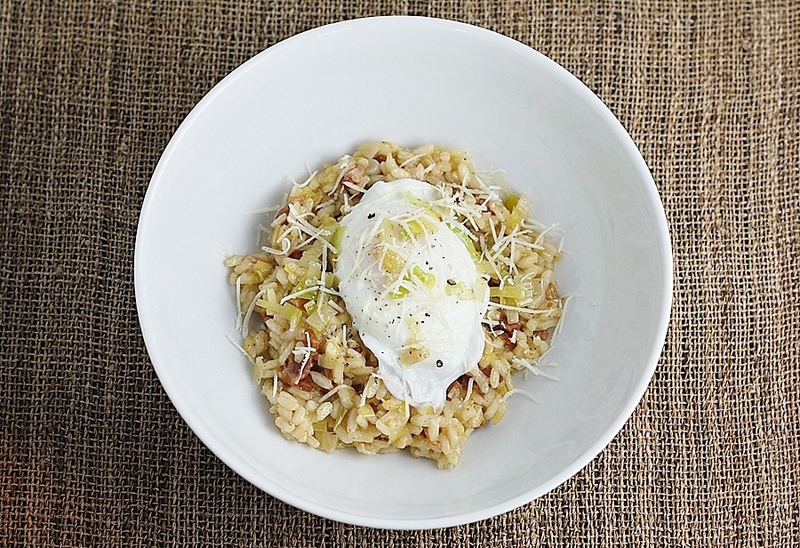 My favorite restaurant Tilth will occasionally serve a poached or sous vide egg on top of their risotto or homemade pasta dish – and it makes me melt. I love breaking into that egg and watching the yolk get into all those nooks and crannies – creating a beautiful silky sauce that coats the dish. Yum, with a capital Y. Well – that’s what this dish was all about. I closed my eyes, and I swear I was eating at my favorite restaurant. The kids loved it too – my older daughter loved the eggs so much – she had two. That was quite a compliment. 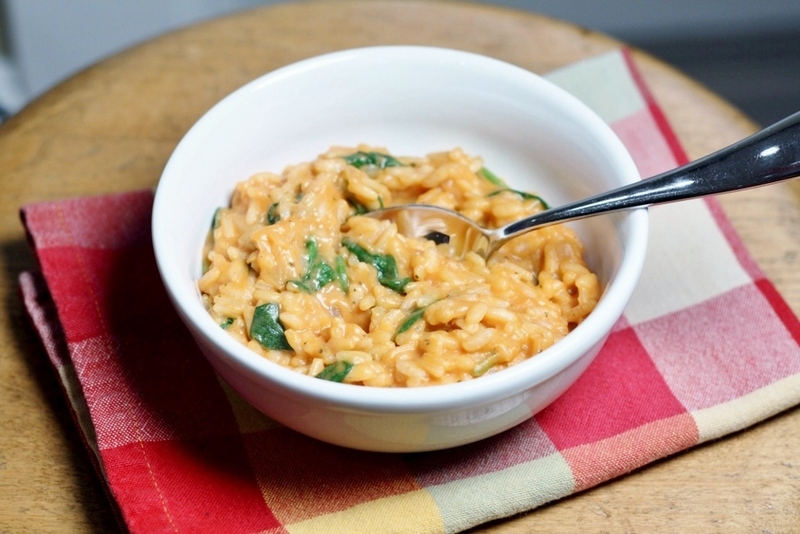 Even since I made this almost hands-free version of risotto, I have been wondering how it compares to the workout version – where you stir for at least 20 minutes. Of course I have made risotto before, but I felt like I needed to make it again, just to be absolutely sure. Plus, I felt like my arm needed a little exercise – typing on the computer all day does nothing for me. I was ready. 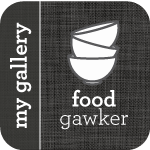 I took this recipe out of the pantry that I found in Cooking Light, adapted it slightly to my taste, and to what I had in the refrigerator – and off I went. I couldn’t believe it – but it tasted exactly the same. 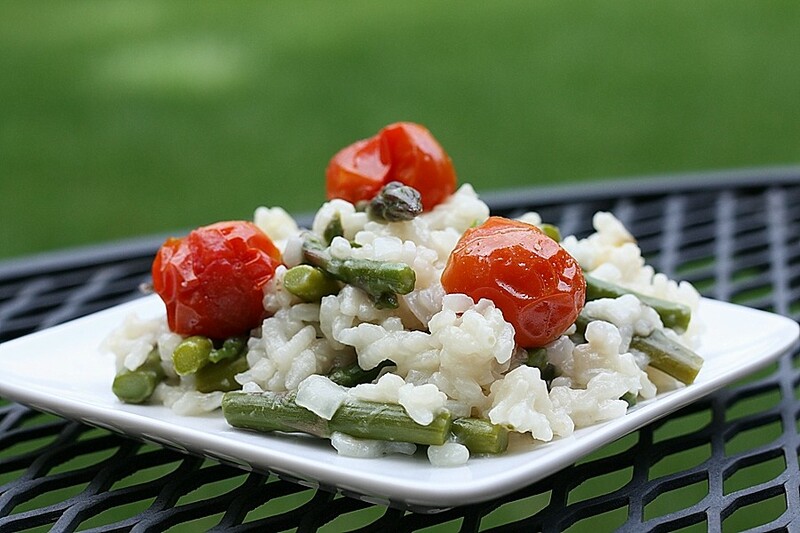 This batch of risotto was really no better (except for the fact that it had some delicious fresh asparagus and beautifully roasted cherry tomatoes) than the hands-free version. I guess there is really no need to ever stir risotto by hand again, unless your arm really needs to get some energy out (like we say to our kids – go run around outside, get that energy out). This technique for roasting cherry tomatoes is also excellent over pasta with some bread crumbs and mozzarella cheese – my neighbor has an awesome recipe that I will make soon and get it on the blog. Perfect for those vine ripened cherry tomatoes that you will start seeing in the next couple of months – or if you live in Seattle, maybe next summer. Toss 1 1/2 teaspoons olive oil, 1/8 teaspoon salt, and tomatoes on a parchment-lined jelly-roll pan. Bake at 400° for 15 minutes or until tomatoes burst. Heat 5 1/2 cups broth in a saucepan over medium heat (do not boil). Heat remaining 1 1/2 teaspoons oil in a large Dutch oven over medium-high heat. Add onion to pan; cook 5 minutes, stirring frequently. Add rice; cook 1 minute. Stir in white wine; cook until the liquid is absorbed, stirring constantly. Add broth, 1/2 cup at a time, stirring constantly until each portion is absorbed before adding the next (about 20 minutes total). Add asparagus to pan with last 1/2 cup of broth. Remove from heat; grate 1 ounce cheese. Stir in grated cheese, remaining 3/8 teaspoon salt, and juice. Spoon about 1 3/4 cups risotto into each of 4 bowls; top evenly with tomatoes. Shave remaining cheese evenly over each serving; sprinkle with pepper. 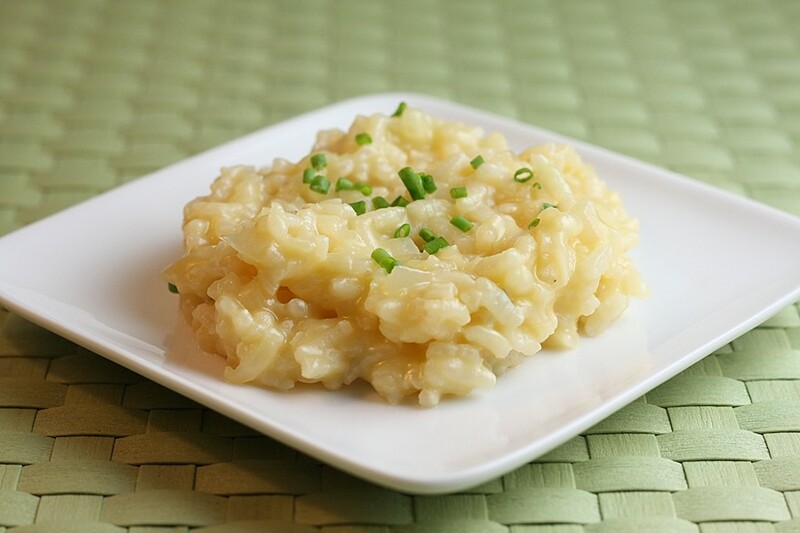 I love risotto – I try and make it at least once a year. The problem is that I need dedicated stove time with no interruptions – which doesn’t happen to often with two girls that are constantly vieing for my attention. Although, I do love the workout I get by stirring something consistently for 20+ minutes. Bring broth and water to boil in large sauce-pan over high heat. Reduce heat to medium-low to maintain gentle simmer. Heat 2 tablespoons butter in large Dutch oven over medium heat. When butter has melted, add onion and 3/4 teaspoon salt; cook, stirring frequently, until onion is softened but not browned, 4 to 7 minutes. Add garlic and stir until fragrant, about 30 seconds. Add rice and cook, stirring frequently, until grains are translucent around edges, about 3 minutes. Add 3/4 cup hot broth mixture and stir gently and constantly until risotto becomes creamy, about 3 minutes. Stir in Parmesan. Remove pot from heat, cover, and let stand 5 minutes. Stir in remaining 2 tablespoons butter, lemon juice, parsley, and chives; season with salt and pepper to taste. If desired, add up to 1/2 cup remaining broth mixture to loosen texture of risotto. Serve immediately.